Long ago, two years ago, I used to do a countdown on this blog space every Friday. That's kind of a busy day of the week in my world, which is why the "Friday Five" has slowly disappeared over that time. I still like the idea of having a countdown post, so I am going to try something a little different, and see if it sticks a little better. Sticking with cards, not stats and numbers. Maybe an occasional pop culture type of post. 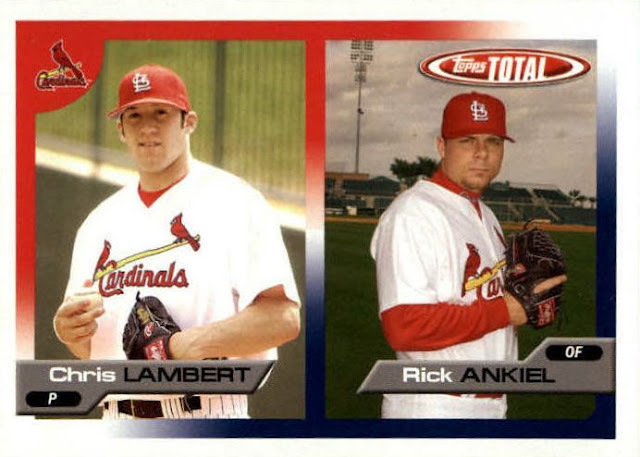 which made everyone correctly speculate that Topps was bring back their early 2000s behemoth Topps Total. It was 990 cards with roughly 30 cards per 30 Major League teams. The product was affordable, and the ultimate challenge for set collectors. 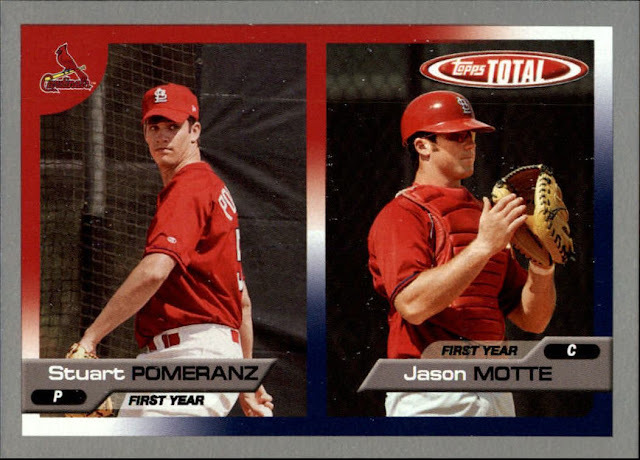 I am not sure if I have ever actually finished a Topps Total set, but I at least have the Cardinals cards completed. There are actually some interesting Cardinals cards in the Topps Total sets, so I thought I would pick out a few of my favorites for this week as my first Countdown subject. Marrero appeared in all three Topps Total sets, all with different teams. The Cardinals in 2003, the Braves in 2004, and the Royals in 2005. 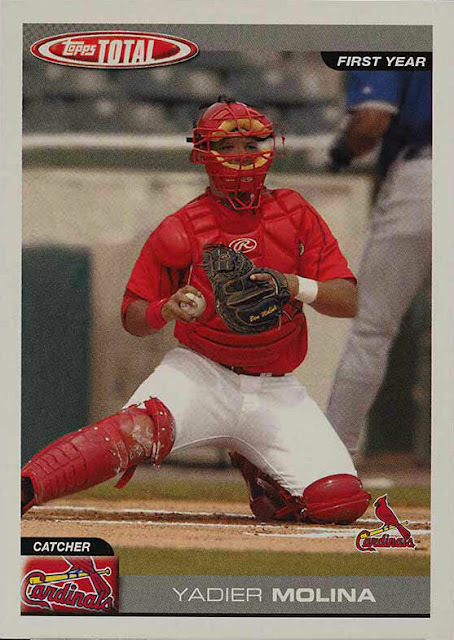 This was one of Marrero's last Cardinals cards, as he was traded away to the Braves for Adam Wainwright. He is also the "best" Cardinals autograph that you can find in a Topps Total set. His competition is Jimmy Journell. It was a successful position change. If you have not followed his career, Motte had some arm troubles with the Cardinals and has bounced around since. Still, you pitch the last out of a World Series, you tend to get remembered. Another prospect type card from the 2005 Topps Total set. I initially thought that this card was some sort of terrible way to help Topps fit players into the set, while maintaining the desired number of cards in the set. There are a few cards like this in the set that stray from the prospect/prospect format and have a prospect/old guy. Like there is an Adam Wainwright card like this with Cal Eldred. This is Topps, so cutting corners is totally fair game. This is actually a prospect card. Ankiel is listed as an outfielder on the card, and this is actually after he went back to the Minors and quit pitching. Hard to keep track of all the dates with Ankiel, but he last pitched in 2004. We can argue whether or not a 25 year old in A Ball is a legit prospect some other time, but Lambert was also an A Ball player. They seem like they might fit together. Chris Carpenter was on the Blue Jays for a few years at the beginning of his career. He had some arm troubles, got released, and the Cardinals signed him. 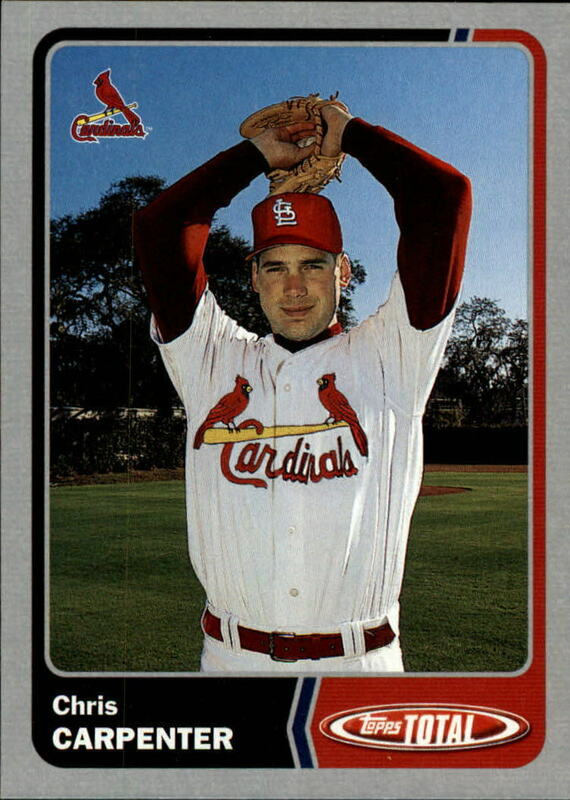 Carpenter hung out in the Minors for awhile, made his way back to the Majors, and by 2004 was in the Cardinals rotation. Between 2003 and 2004 Topps made two cards of Chris Carpenter. 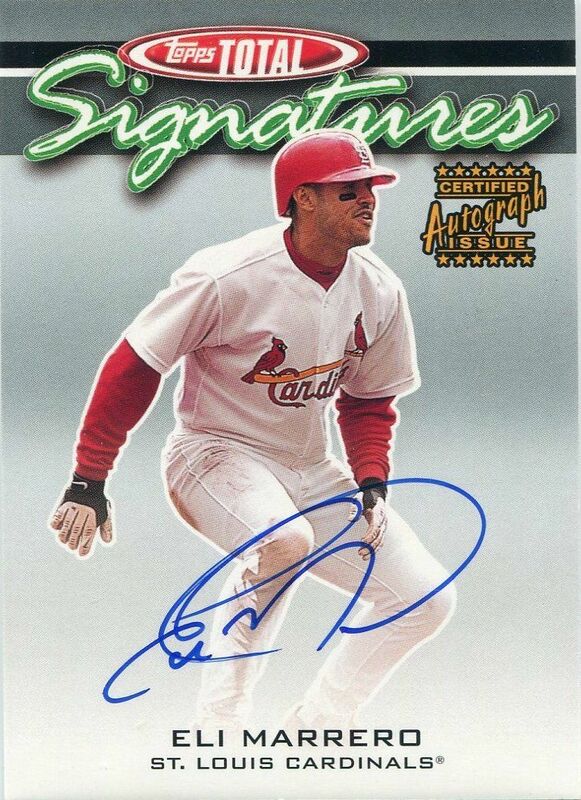 Yes, the airbrushing is terrible, but this card is the first Carpenter in a Cardinals uniform. Sort of an important recent player. Ask a Phillies fan. There are better Yadier Molina rookies, but this one still counts. I like that he is catching on this card, as opposed to his Bowman rookie card where he is batting, and wearing a jersey with a 70 something number on the back. I love countdown posts almost as much as I enjoy Topps Total from back in the day. 2019 Topps Total? Well that's another story. 2019 Total looks like a disaster. I have actually seen a Jason Motte Cubs card. It's an oddball. Let go back and see if I can find it again. This should make for a fun series! I hope so. I like countdowns, they are fun to think about. The Mayor of Kings Mountain. Take 2.